Fathers are often disrespected or overlooked in the media. However, a refreshing video occasionally appears that focuses on the good things dads do or the role that they play in their own families. These growing videos are beginning to shine a light on Father's Day and how fathers are celebrated on their own holiday. Explore these stories with your dad or secure his memory for his special day. This joyful video, Father & Son Slow Motion, is about a father and his adult son who have a day playing in the yard while they do yard work. Silly, sappy, and fun, this video warms the heart and celebrates what it means to be a dad. The musical score behind the video is called Carry On and is written and performed by the group Scott and Brendo. Father's Day is the quintessential video that reminds us of all the sacrifices fathers make for us. 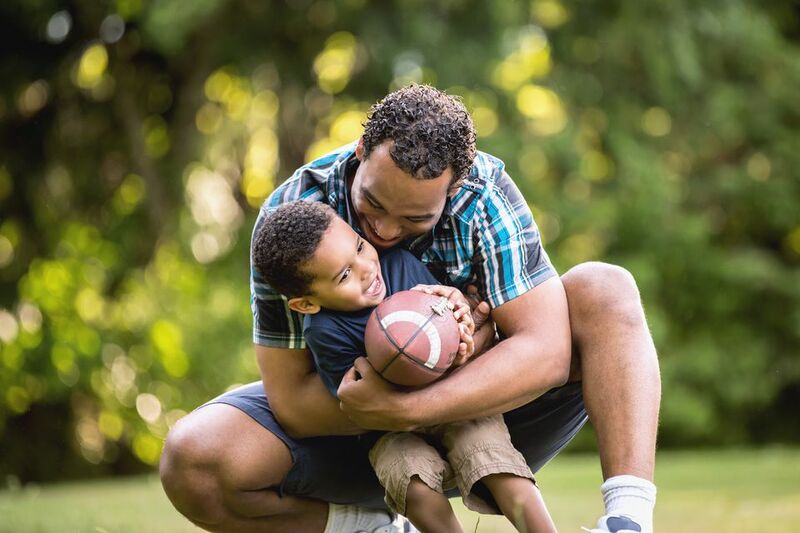 Whether it's going to work, saving for vacations, changing tires in the rain, or scaring monsters away in the middle of the night, dads are always there. This is a great video to watch with your dad before telling him how much he means to you. The musical tribute, Dad You're My Hero, ​showcases the talents of singer Teresa James and writers Gloria Sklerov and Barbara Rothstein. This black-and-white video highlights the sentimental moments we share with our father growing up. Any dad will love this story and feel closer to his little girl, as he watches it with her on Father's Day. Dad Life features a hip-hop rap with dads young and old. Originally an American Greetings e-card for Father's Day, this video is short, to the point, and creative. Crack dad up on Father's Day with hilarious lines like, "We splishy-splashy for an hour or two." This short video includes hundreds of young fathers walking through downtown Denver. Each dad holds a single child in his arms, creating a huge reaction amongst people in the crowd who had no idea what was going on. Watch this creative flash mob video and celebrate how this community honored Father's Day in a surprising way. Father's Day Short Film is an adorable short video about a little girl who wakes up and realizes it's Father's Day and she hasn't planned anything for him. To rectify the situation, she goes off on her bike to get a Father's Day gift ready. On the way, she encounters her older brother with his gift for dad—and so begins the race. Enjoy this cute video (with an engaging musical score) with dad on Father's Day. Kids from City Life Church share what their dad means to them in this fun, fast-paced, and touching video. There are few better reminders about how children see their dad through their eyes. Any dad will love this video about how he's their son or daughter's superhero. There are few things that bind a son to a father more than the shared love of a hot car. In this video, an adult son and his dad take a 1974 Mustang out for a test drive, and the story unfolds from there. This third-winning entry to the Ford Mustang Stories advertising campaign was shown on the 2010 Mustang website.